Does your dog dislike being touched? Here’s what you can do. Dogs can become fearful of many things through no fault of their own. Examples include: noises, riding in cars, touch, veterinarians, animate and inanimate objects, etc. The list is virtually endless. While some dogs express this fear by trying to scare the feared item away by barking, growling, and lunging, other dogs simply attempt to avoid the scary thing by keeping a safe distance from it. Why do dogs become fearful of things? There are a number of reasons that cause a fear response to specific triggers in dogs. The list includes, but is not limited to, genetic factors, neonatal experiences, adult experiences, etc. The most successful way to address these fears is through a process called desensitization and counter-conditioning. Desensitization is the process of exposing a dog to a trigger beginning at a very low intensity and gradually building. Think of a human child that is afraid of the deep end of the pool. Desensitization starts this child on the steps of the pool and over a period of time slowly moves him or her toward the deep end of the pool as he or she is comfortable with doing so. The same concept is used with fearful dogs. Counter-conditioning is different from desensitization and is an additional technique for changing a dog’s feelings or emotional response to something that it considers scary. In dogs, counter-conditioning is most commonly done by presenting a food treat when the dog experiences the trigger while simultaneously calm. A training clicker can be used to make this process even more effective. Counter conditioning and desensitization are normally done together. 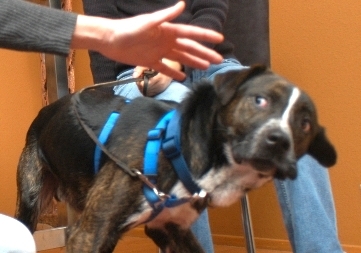 An example of a desensitization and counter-conditioning program for a dog that is fearful of being touched and petted (i.e., fear of human handling) is provided below. While this is a specific example, the principles apply to virtually anything a dog might fear. 1) Max’s pet parents (the Swansons) first had to determine at what point Max became bothered when someone touched him. How close could they get to him? Where did he dislike being touched the most and the least? They determined they could touch him gently on the side of his body and he was okay with that. Any more than that and he stiffened and started to growl a little (some dogs may respond by just attempting to move away instead of getting grumpy). 2) The Swanson’s next step was to determine what food treat Max really liked. They already knew that Max loved the small training treats they had been giving him so they decided to use those. They knew that these treats needed to be very small, as Max would be getting a lot of them. 3) They decided to use a training clicker when working with Max to help these exercises be as effective as possible. Some dogs are fearful of the clicker and it shouldn’t be used in those cases*, but Max was okay with it. They were going to systematically and repeatedly touch Max, click the clicker and then give him one of his training treats. The process always looked like this: touch -> click -> treat. And they were careful to always give Max a treat every single time they clicked the clicker. 4) The technique was to start at a place on his body where he was completely comfortable and over time very slowly move to a place on his body where he was less comfortable. Mrs. Swanson just stood near Max and repeatedly clicked and treated when he looked at her. She did this until Max didn’t seem to even notice Mrs. Swanson any longer. Mrs. Swanson next moved a little closer to Max and continued to click and treat until Max started to look somewhat bored! Next, she barely touched Max’s side (remember, that’s where he is the least uncomfortable with human touch) and repeatedly touched, clicked and treated. Touch -> click -> treat, touch -> click -> treat, touch -> click -> treat… Mrs. Swanson knew that at any time Max got the least bit grumpy that she was moving too fast and should back up a little in the process. When Max seemed to be losing interest in the exercise, Mrs. Swanson knew it was time to go to the next step. Remember, some dogs try to move away instead of getting grumpy – but the process of desensitization and counter-conditioning remains the same in both cases. Mrs. Swanson next moved her hand a little closer to Max’s head and continued to click and treat over and over until Max seemed to lose interest in her hand again. In addition to carefully and slowing moving closer to Max’s head over time, Mrs. Swanson very slowly added in a little pressure on Max’s body and some movement in her touch. Mrs. Swanson continued to slowly move closer to Max’s head in very small steps until she was touching Max’s head while clicking and treating him. This process was repeated many days in multiple 3-5 minute sessions. Each time Mrs. Swanson started the exercise she started a little further back on Max’s body than where she finished in her prior session. It was very important for Mrs. Swanson to read Max’s body language throughout the entire process to make sure she didn’t go over Max’s tolerance threshold for being touched (i.e., move too fast). When Max’s tolerance threshold is exceeded this means he is uncomfortable with how he is being touched. If this happened, Mrs. Swanson just backed up a little. 5) The Swanson family also knew that it was important to have multiple adults in the family do these exercises with Max in order for him to learn that it’s okay to be touched by all types of people – not just Mrs. Swanson. It also provided a way for all adult family members to share in the training. They also knew that it is helpful to do these exercises in different locations in the house so that Max doesn’t think it’s only okay to be touched by humans in certain locations. 6) Before any of this training started, the Swanson family had a family meeting where they discussed the importance of learning the basics of dog body language so they could look at Max and know if he was uncomfortable with the pace of his treatment plan. If he was uncomfortable, they knew to back up a little. They also knew that if Max started to show aggression (e.g., barking, biting, lunging, growling, etc.) or a panicky need to escape during these exercises they would immediately abandon the training and get the help of an independently certified dog behavior professional. 7) The Swansons wondered how many of these 3-5 minute sessions it would take for Max to better tolerate being touched – they knew he would never be 100% okay with human handling, but they wondered when they would see improvement. They talked with a canine behavior specialist and he told them it could be as few as 15 sessions or as many as a 100 – or even more! He told them Max would let them know how many sessions it would take through his body language. The specialist also reminded them that Max probably would need occasional reminder or refresher sessions throughout his life. * If a dog appears to be afraid of the sound of a clicker, then the reinforcement can change from [touch -> click -> treat] to simply [touch -> treat]. The clicker is removed, but the process remains identical. As an alternative, a verbal marker (e.g., “yes”, “good”, etc.) can take the place of the clicker [touch -> “yes” -> treat].